Back when I was releasing “Fury of Solace,” we had a decidedly modest contingent of viewers who interacted with the characters on Twitter. I don’t think any of them went so far as to create roleplay accounts specifically for the series, generally people who engaged on that level interacted with the characters as themselves. Well, the fanbase of “The New Adventures of Peter and Wendy” is much larger, even more avid, and empowered to an even greater degree. 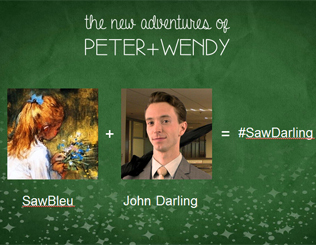 I’m the transmedia producer for “New Peter and Wendy,” and as I mentioned in an earlier post, we followed in the footsteps of shows like “Welcome to Sanditon” by encouraging fans to create their own roleplay characters, and the social media accounts that go with them. This post is about what happens when you give the audience that much agency; how you roll with the punches, embrace the happy accidents, and craft a narrative with those fans in mind. One thing that this brand of social media storytelling allows you to do is to canonize fan-created characters and content. And as I’ve mentioned in the past, there are no more loyal fans than those who feel you respect their contributions to your story world. Let me give you my favorite example of this from “New Peter and Wendy” season one. A staple of the transmedia component of “New Peter and Wendy” are our Twitter events, which I spoke about in more detail in last week’s post. In short, Twitter events are basically scheduled excuses for a bunch of the official characters and fan characters to congregate online. Now let me tell you about one Twitter event in particular. During the first season, the titular Peter and Wendy were involved in a relationship with one another, and one episode in particular was the prelude to a scavenger hunt that Peter arranged for Wendy. The scavenger hunt itself was one such Twitter event, in which a group of fan roleplayers helped Wendy unravel Peter’s clues. Now, per the original scripts, the culmination of the scavenger hunt was going to be a romantic picnic that Peter put on for Wendy. But during the first season, I was fortunate enough to be a part of weekly transmedia meetings with “New Peter and Wendy” scribe Shawn DeLoache and producers Kyle Walters and Jenni Powell, in which we planned out our transmedia plotlines for the course of that first season, and responded in real time to fan roleplay developments which none of us in our wildest dreams could have predicted. Well, it just so happened that the fans had created an event called the Neverland Midsummer Masquerade ball which was scheduled to occur very shortly after the aforementioned scavenger hunt, and someone at one of our transmedia meetings suggested that we might adjust the culmination of the hunt to be Peter asking Wendy to be his date for the dance. We didn’t have time to film an actual video, but Kyle and Paula Rhodes, the actress who plays Wendy, posed for a series of cute photos, in which Peter asks Wendy to the ball via a series of visual aids. This was the first major example of us canonizing fan content, and the fans were over the moon about it. For a brief, shining moment, the fans believed we were so wildly prophetic as to be able to incorporate a masquerade ball into our story that wouldn’t have been created until months after principal photography had been completed. In truth, we were just reacting to roleplay developments in real time, and the synchronicity of the timing of the scavenger hunt and the masquerade ball was too good an opportunity to pass up. And, ultimately, this not only made the fans feel like a much bigger part of our story world, it also resulted in something better than had ever been on the script page. And let me tell you another fun anecdote about unexpected fan interactions. In “New Peter and Wendy,” Graham Kurtz’ John Darling is beloved by male and female fans alike. Now, one such fan, whose roleplay character was a fairy by the name of SawBleu, had a bit of a crush on John. John, in our version of the Peter Pan story, is a bit OCD about cleaning, so at one point during season one, SawBleu invited John over to her place to help clean her apartment. It sounded like something John would do, so I agreed on John’s behalf, and proceeded to roleplay out the scenario with this fan, over Twitter. This would be my first major encounter with the phenomenon which is called, in the parlance of our times, “shipping.” When fans “ship” two fictional characters, they are expressing their heartfelt desire that those two characters should become romantically involved with one another. And I quickly learned that SawBleu was not the only fan who had a vested interest in she and John getting together. A whole group of fans were shipping #SawDarling, or similar such portmanteaus. While John was helping SawBleu clean, she asked him to a movie, which really forced me to think on my feet. There are any number of reasons why a fictional character from our story can’t date a fan roleplayer. For starters, I don’t know how old this fan is. What’s more, were this relationship to have occurred, SawBleu would have become far too integral a character in our ongoing story to justify her absence from any of the subsequent videos. And there’s actually also a story reason why this pairing wouldn’t have worked, but I’ll get to that in a minute. John very diplomatically agreed to accompany SawBleu to a movie, but insisted that he was too busy with his job at the local newspaper to get involved in a romantic relationship. But this would not deter SawBleu and the rest of the #SawDarling shippers. On an evening of roleplaying that fans would subsequently refer to as John and SawBleu’s “undate,” the #SawDarling shippers pursued John and SawBleu, in disguise and from a discreet distance, to engage in not-so-subtle romantic entreaties, a la the “Kiss the Girl” scene in Disney’s “The Little Mermaid.” These shippers would later form a local Neverland organization which they called FateStalkers, whose stated purpose was to help facilitate romantic relationships between often star-crossed individuals, whether they like it or not! In any event, John resisted SawBleu’s advances, much to the FateStalkers’ dismay. When I tell this story, I only half jokingly say that being awkward on a date is something which is not at all difficult for me to roleplay. But in the second season of the series, there was a story development that made the whole affair make even more sense, in retrospect: in season two, we learn that John Darling is gay. This, it seemed to me, was too good a transmedia opportunity to pass up. I got it in my head that John Darling would have a Direct Message exchange with SawBleu, a private exchange between just the two of them, in which he explained precisely why their undate played out the way it did. SawBleu was, of course, very supportive, and touched that John would make such a gesture. I would have been perfectly happy if this exchange had remained a cool transmedia experience for an audience of one, but I’m very gratified that the fan who plays SawBleu posted a screenshot of it on her tumblr page. In any event, no one on the “New Peter and Wendy” side was going to broadcast this on our own; whether or not this private moment was made public was going to be up to SawBleu and SawBleu alone. There’s honestly far too many amazing “New Peter and Wendy” transmedia moments that have developed organically from fan roleplay to mention all of them in one blog post, but I’ll end on this one. In season two, (spoiler alert) Wendy is dating her ex Peter Pan’s longtime rival, Jas Hook. Needless to say, Peter is none-too-happy about this development. John suggests that if Peter wants to convince Wendy that she’s made the wrong choice, perhaps “the play’s the thing.” So Peter arranges to put on a very meta play called “Panlet” at a local Neverland community theater, in which the characters are thinly-veiled versions of Peter, Wendy, Hook and some other members of our supporting cast. A few days before the performance, Peter cast some of the fan roleplayers as actors in his play. We wrote the “Panlet” script, distributed it to the fan actors, then had a live “performance” of the play on Twitter, the fans tweeting their lines at the appropriate times. As you can see, instead of making the transmedia experience broader for season two of “New Peter and Wendy,” if anything, I made it more personal, rewarding the more prolific fan roleplayers by putting them at the center of the action. And we were also extending our fans quite a lot of trust. John Darling, for instance, told SawBleu about his sexual orientation via Twitter DM before it was 100% revealed in any of the video episodes. John asked her not to talk about it openly just yet, but there was a real possibility that SawBleu could have spilled the beans ahead of time, if she’d wanted to. I trusted that she wouldn’t, and ultimately my trust was not misplaced; she didn’t post the screenshot of the DM exchange until well after that particular plot development was revealed in the actual series. Likewise, for our “Panlet” performance to go off without a hitch, we had to trust that the fan actors we cast would show up for the online performance and deliver their lines at the right times. But again, that the fan actors would be ready and able to perform their roles in the play was, as far as I was concerned, never in question; the only person who ultimately flubbed a line was me, and the fans very deftly course corrected without missing a beat. All of this said, as you can no doubt imagine, giving the fans this level of agency in your series can also be quite scary, from a creator’s perspective. Allowing the fans to interact with the characters online in real-time as the series is released acknowledges that the fan contributions are at least semi-canonical in the world of your show. It’s very possible that some roleplayers could be a little too attention hungry, trying to insert themselves into the action in inappropriate or incongruous ways. It’s just as possible that the fans, via the video episodes, can have information that some of the characters don’t yet, and it is thereby within the fans’ power to pass said information along to your characters before they are supposed to learn it in the natural course of your story. These things are unavoidable, and on the rare occasion that they do occur, I engage in what I call “selective hearing.” It’s not my place to tell the fans how they’re supposed to play in this sandbox we’ve created, and I would never presume to; if the fans do something that doesn’t really fit within the story as we’re telling it, I simply don’t have the characters acknowledge it. But 99% of the time, in my experience, the fan roleplayers are entirely respectful of the process, understanding their role in the transmedia experience and not crossing any lines they’re not supposed to. And, as you can probably tell from some of the anecdotes above, more often than not the organic developments that come from fan roleplay actually make your overall story all the better! Another fascinating prospect of fan roleplay is that those fan-created characters can (and do) persist after the show that spawned them is officially over! The aforementioned “Welcome to Sanditon” was a webseries based on an unfinished Jane Austen novel, set in the fictional town of Sanditon, California. After that series ended, fan roleplayers from that series migrated over to “New Peter and Wendy,” some of them even including in their Twitter bios, “I used to live in Sanditon, but now I’ve moved to Neverland.” And I have no doubt that some of the fan characters created specifically for “New Peter and Wendy” will live on after our third and final season has finished airing. Historically, certain fandoms, and even fan fiction, have lived on past a series’ official expiration date, but what’s happened with shows like “Sanditon” and “New Peter and Wendy,” I think, is another animal altogether; it’s fan fiction that the show’s creators acknowledge as fan fact. Something which is wholly unprecedented in the history of serialized storytelling.